The ukulele has been described as the music instrument underdog – but it is making an amazing comeback! Uke Jam! intends to encourage this! We are a group born from the CALL Interest Group: “Ukulele Intro – the Happiness Fix”. We have decided to continue on a weekly basis. We will play the songs we know and learn some new ones too! We will explore how to use our IPADS and ONSONG. We try to arrange guest instructors from time to time. Come join us when we play and sing with our ukuleles. Once in a while we will open our group up to any acoustics players (guitar, mandolin, banjo, hand drum, etc.) or singers to join the festivities! If you are new to the uke, or just want to try it out – join us! If you are a player already – join us! We have had a lot of fun and have room for more! 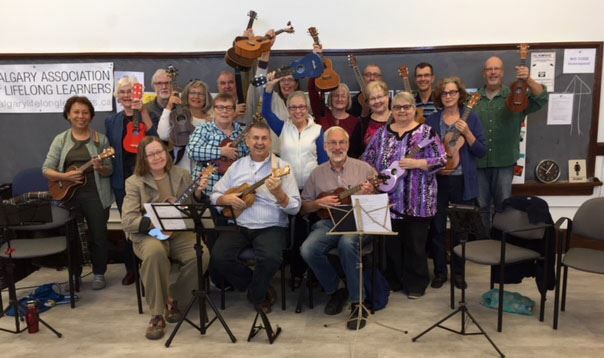 This group of keen ukulele enthusiasts gathers weekly (see schedule). Are you new to the Ukulele or have forgotten most of what you once knew? Are you a recent graduate of the Happiness Fix? Do you like to sing and would love to strum along to old favourites, and even some new tunes…..but you need a little more help? This Jam is for you! We will be playing songs that have 2 – 4 chords, a simple strum, and are easy to sing along with. We will introduce new chords, or simple enhancements as we get more familiar with the song set. We will learn more about Onsong, inputting songs, sharing and beaming songs….We will learn a little bit more about the fretboard, how to read tab, and some simple 2 and 3 part ukulele instrumentals. Before you know it you will be playing at the jam every week! Drop – ins are welcome, non-CALL members are $5 per jam, payable at the jam! Are you itching to show everybody something new on the Uke (a new song, picking, new strumming, chord melody, etc)? Do you want to push your ukulele experience a little further? This might be the place for you – come join like-minded people to pick a direction to take this jam, bring 8 – 10 copies of instruction, music, etc, and introduce the concept you want to work on…sometimes an epiphany can happen when more than on mind is working on it! If you are just curious, but not sure what to suggest, just come anyway – see what is happening! CALL is all about peer based learning, and if you have anything you want to teach – or learn - BRING IT or let me know & I will schedule it! You have Onsong loaded and want to learn more about how to use this powerful tool to enhance your repertoire and get the songs you want into a usable, sharable format. Calgary Public Library Music Programs: **in conjunction with the CALL Uke Jam! Celebrate World Play Your Ukulele Day with a massive ukulele jam. All ages and stages welcome. Bring along your ukulele. Limited library ukuleles provided. In partnership with Calgary Association of Life Long Learners. See Calgarylibrary.ca/music for a full schedule of events. Join the Calgary Ukulele Festival for weekly ukulele jams in August. Limited experience required. On lovely summer days, the group may jam in Central Memorial Park. In partnership with the Calgary Association of Life Long Learners. Street parking for FREE at 6 p.m.! Weather permitting – we will be outside!